The kitchen knives of the Pro series by Zwilling have a blade that is forged from 1 piece of steel. The blade runs entirely in the plastic handle giving you ' full tang ' construction. The blade is made of ice-hardened Friodur steel which has been heated up to 1000 ° C in 4 stages, and then cooled to -70 ° C. This technology, which was perfected by Zwilling, ensures that sharpness, durability and, elasticity. 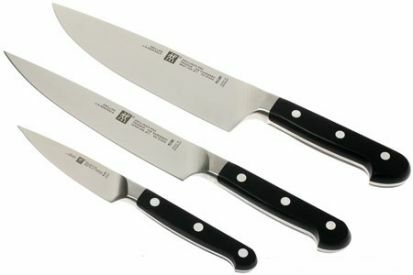 Set includes 8" chefs knife, 8" carving knife, and 4" peeling knife.